Weber Packaging Solutions manufactures a very broad line of labels and tags at our 320,000-square-foot manufacturing plant. All operations are accomplished in our facility, from complex label graphic design, prepress and digital printing plate preparation, to label printing, inspection and packaging. With over forty Mark Andy flexographic and HP digital label presses under one roof, we are able to select the most productive printing technology for a particular order. 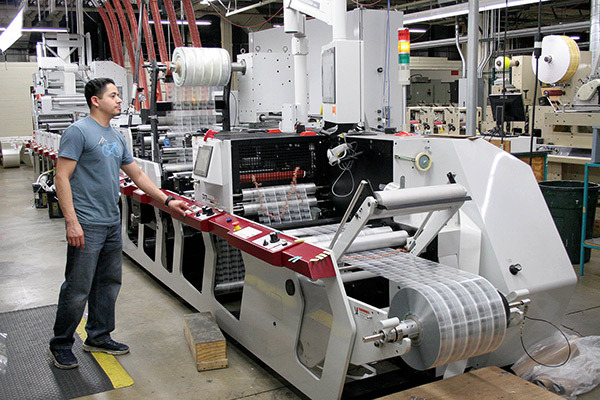 These high-speed presses print labels in up to ten colors, including high-resolution four-color process. In addition, Weber designs, fabricates and assembles a wide selection of standard and customized label applicators and label printer-applicators. These systems feature high-speed, precise label placement along with unsurpassed label print quality. We are proud of our manufacturing plant and its capabilities. Site tours can be arranged through your Weber account manager.